Plot Summary: Kenji Okado has a secret. Trained since birth to be the ultimate weapon against a threat that might not even exist, he is struggling to navigate high school. His world changes for the better when popular student Hyrum Decker becomes his lab partner, but little does Kenji realize how his newfound friendship will be tested when he and Hyrum discover the hidden potential of a family heirloom. Thank you to the authors for providing me with a review copy of this book. Also a big thank you goes to Esme over at the Weatherwaxreport for setting up TBRindr. While it sounds absolutely great on paper, it never really fully grabbed me. The first thing I noticed was the stunning cover. I would love to own that pendant, even though I rarely wear jewellery. The second thing I noticed was how impeccably this book is edited. The prose is straightforward and very pleasant to read and the plot moves along with a good pace. However, there's a lot of exposition and quite a bit of telling. The opening pages describe Kenji's bedroom and morning routine in detail, and that's not something that will hook me. While I didn't think the characters were particularly well developed throughout the story, they did start out strong and distinct. I enjoyed the friendship between Kenji and Hyrum a lot. I'd love to see more friendships like this between young adults and teenagers. The world building is interesting, and I appreciate diversity a lot, but at times it felt like Kenji's Japanese culture was shoved into the reader's face so to speak. Diversity should be a natural aspect of any setting and every story but not something that stands out like a sore thumb, at least in my opinion. I think this a solid debut and am excited to see what else these authors will come up with. 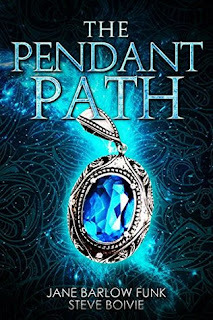 The Pendant Path is a light and easy read that will definitely appeal to younger readers. 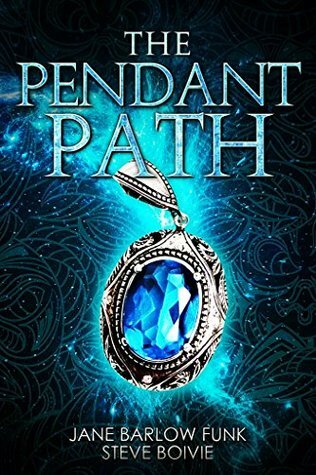 Recommended to any YA fantasy fan who is intrigued by the synopsis and likes portal fantasy. Too bad this one didn’t really deliver. It seemed to have a lot going for it but the execution just wasn’t on par. I love the cover as well! And like you said, it's the first thing that grabbed my attention. Sorry The Pendant Path didn't go as well as you hoped!